Meet Donna Lucia an elegant, feminine and graceful calligraphic handwritten script font, plus a Symbols font with 52 lovely hand-drawn swashes and illustrations and BONUS! 3 pretty premade logos & 5 delicate watercolor splashes! 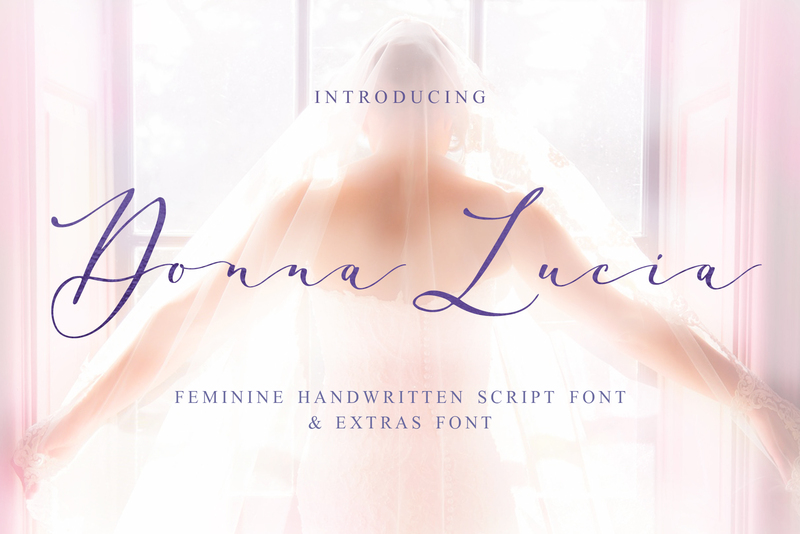 Donna Lucia script is perfect for branding, logos, wedding stationery, social media, packaging, and other projects that require an elegant touch. Donna Lucia script contains a full set of uppercase letters and 3 full sets of lowercase letters, (standard, alternative, and initial form) and 27 ligatures – which can be used to create a handwritten calligraphy look. Donna Lucia Symbols is a font with over 52 hand-drawn elements, illustrations, and swashes and can help to make your design more original. Combine and arrange swashes and illustrations to create your own designs and make borders, frames, dividers, logos and more (just use A-Z and a-z keys in the included Donna Lucia Symbols font). A different symbol is assigned to ever uppercase or lowercase standard character so you do not need graphics software just simply type the letter you need. For your comfort symbols that are included in Donna Lucia Symbols.otf font is also saved in vector (EPS 10) and PNG formats. You can choose either to type symbols or to add them as illustrations. BONUS! 3 pretty premade logos & 5 delicate watercolor splashes! Character map JPG document with listed all glyphs, ligatures, and swashes. Having opening these files during working progress may save your time on searching appropriate glyph. Instruction on how to help fonts work better in MS Word is also included. Extensive language support is included. Western European, Central, and South East European too. Just type a message in the text box below and see if all the characters you’ll need are there. For designers who do have open type capable software: you can access alternates by turning on ‘Stylistic Alternates’ and ‘Ligatures’ buttons on in Photoshop’s Character panel or via any software with a glyphs panel, e.g. Adobe Illustrator, Photoshop CC, Inkscape. A font family published by Ira Dvilyuk on Sunday, April 1st, 2018 that has 1,257 views so far.